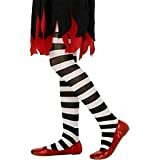 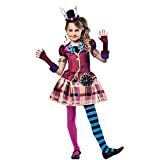 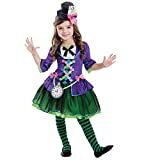 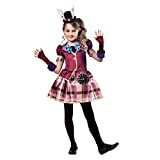 Sizing: Chest 32-34", Waist 26-28", Length 30"
This wacky Mad Hatter Costume features a dress with a faux vest top, purple plaid skirt and attached pink velour jacket with plaid lapels that match the skirt and green ruffles at the sleeves. 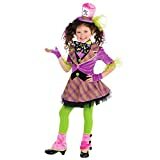 A mini pink top hat with green ruffles comes on a hair clip, and the giant bow choker is printed with colorful teapots. 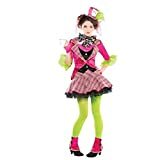 Top off this wild look with the pink glovelettes, neon green tights and pink spats.